With over 40 new Maxi 34-30V30H-R cNODE's in our rental pool. We are able to meet all your project needs to matter how large or small. 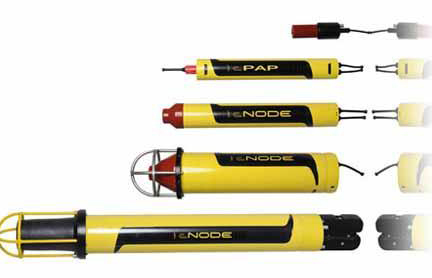 cNODE® is a family of transponders for underwater acoustic positioning and data link. The transponders operate together with both HiPAP®, HPR and cPAP® transceivers. cNODE® utilises Cymbal® acoustic protocol and is compatible with the HiPAP®/HPR 400 channels and telemetry.cNODE® is designed to cover a large range of applications and this is made possible by the modular design and a variety of different transducers, internal and external sensors, housing materials and other add-on functions. cNODE® is easy to set-up, operate and maintain. Both new configuration and software can be downloaded from TTC 30 without opening the transponders. The floating collar and release design make the launch/recovery operation safe and easy. Spare parts for cNODE® are based on the main modules.The cNODE® transponder family consists of the models Maxi, Midi and Mini.